Spring is in the air. Temperatures are warming, flowers are blooming, and this year’s crop of new tires is hitting the shelves. This is the time when tire makers release their latest summer tires–especially the 200-treadwear, extreme-performance summer tires that have become so popular for autocross and track participants. This year’s class includes only one updated tire, but it comes from Dunlop, long a stalwart of the group. Their Direzza Z1 first came out 10 years ago, and the line has been steadily improving through regular updates every year or two. Dunlop typically releases these new tires in Japan first, with U.S. customers getting them about a year later. True to form, the Japanese-market ZIII superseded the ZII Star Spec a year ago. Thanks mostly to a revised compound, Dunlop claimed, the new tire shortened lap times by 1.5 percent. Does that hold true for the new USDM version? We decided to find out. The current top dogs in the category for both autocross and time trial are the BFGoodrich g-Force Rival S 1.5 and the Bridgestone Potenza RE-71R. Since we haven’t done a direct comparison of these two in quite some time, we chose to put both of them in the test loop. Further, in addition to having our usual two drivers, this time we tested tires on two different vehicles–each one set up for a different class and featuring different rim widths. We also added a completely separate venue, a track test, into the mix. We chose the common 205/50R15 tire size and rounded up the necessary rims. 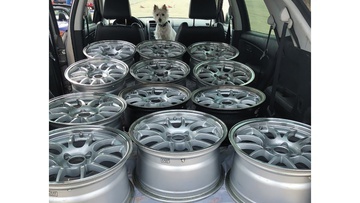 Three sets of 15×8-inch 6UL wheels from 949 Racing came out of our garage, along with a similar quantity of 15×6- and 15×7-inch wheels supplied by friends. 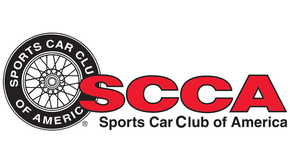 DAVID AND KIM WHITENER are the standard-bearers for hard work and accomplishment in the SCCA Street Touring Sports autocross ranks. Countless hours spent developing and testing new parts, plus time spent evolving their driving technique, have brought them numerous championships and a finely tuned vehicle. On this day David served as primary test driver, while Kim collected both subjective and objective test data. ANDY HOLLIS joined in as a second driver to add veracity to the results and provide another point of view. All have their own driving style and associated setup/tire preferences. 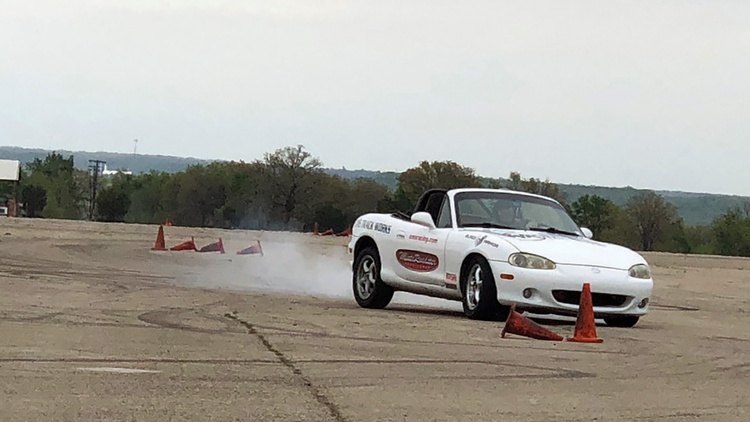 To establish optimal inflation and look for trends, we ran each tire around the skidpad at a variety of pressures using our STS Miata. Given that ambient temperatures were in the low 60s all day, we warmed up each set by doing a few high-slip-angle laps in each direction–what some might call hooning. Even though we’ve done some skidpad work before on the BFGoodrich Rival S 1.5 and Bridgestone RE-71R, we repeated the procedure this day to practice our technique and clean off the skidpad. Each of these known quantities delivered the results we expected: Both turned very similar lap times and were fairly agnostic to pressure from a grip standpoint. The Bridgestone tire felt pointier, while the BFG seemed a bit numb at the limit. This feel could be tuned somewhat by varying the pressures within the optimal range. The new Dunlop Direzza ZIII behaved just like its predecessor: It cared more about heat than inflation. Its quickest laps were its first ones, and it was faster than either of the established benchmarks. As we let more and more air out of the tire, however, subsequent lap times increased. Smelling a rat, we went back to the original high starting pressure–and the tire continued to get slower. The tread surface also became hot enough to burn our hand. In the end, we settled on 28 psi as a hot test pressure for all the tires. 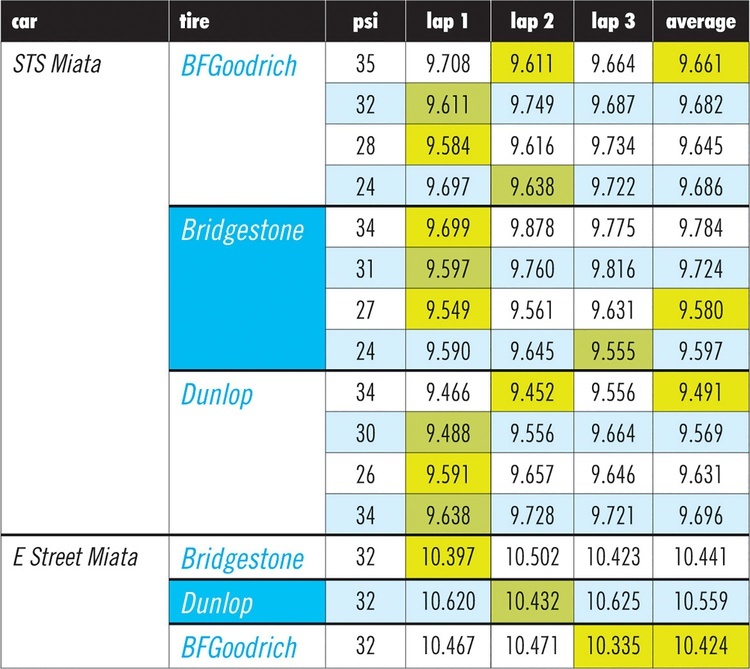 Next, we gathered skidpad times for each tire using our E Street Miata–the same 205/50R15 tires but mounted on 15×6-inch wheels. Thanks to some time constraints, we used the same inflation for each tire tested–32 psi. 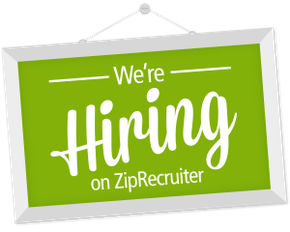 (We arrived at that figure by surveying some of the quickest E Street competitors in the nation.) Our goal this time was to see how pure grip would be affected by the car’s pinched, camber-challenged setup. 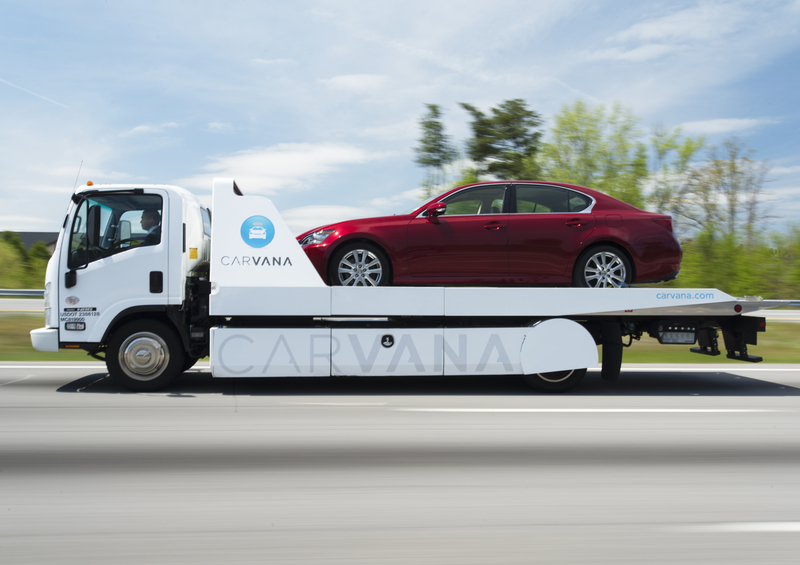 The E Street car felt surprisingly neutral around the circle, and each tire exhibited the same handling characteristics we felt on the Street Touring S car. We were just going a whole lot slower this time–a full eight-tenths of a second slower. Some of that was due to the test car’s stock ride height and suspension settings, but a very large part was simply a lack of grip due to compromised contact patch. Further, note that the Dunlop had gone from the quickest of the bunch to the slowest. Would this carry over to the autocross course? INITIAL IMPRESSIONS: Two characteristics of the Dunlop immediately jumped out: the small slip angles it favored and its very direct feel. The more we turned the wheel, the tighter the tire turned. Still, the breakaway was quite progressive and easy to manage. The Bridgestone had a similar feel, but wasn’t as sharp. The BFGoodrich had the most progressive behavior at the limit, but it spoke a very different language when conveying feedback to the driver. Moving over to our permanent test course, which combines a slalom with offsets as well as both on- and off-camber sweepers, each driver took two pairs of two-lap runs on each set of tires. Subjective comments were collected during each cooldown break. We started with the BFGoodrich; then, after running through the other two tires, we ran the BFGoodrich again at the end of the rotation to ensure consistent conditions. We collected a lot of data, and there are a lot of ways to slice it. We’ll present it all here so that you can draw your own conclusions. For us, the obvious point is that in this application, the Dunlop performed nearly as well as the BFGoodrich and Bridgestone, especially once heat tolerance was pulled from the equation. On cooler days, or with plenty of break time between runs, the Dunlop will be very quick. Our test schedule limited the cool-down time between each test, however, so our drivers delivered lap times that were progressively slower on that tire only. Andy, who likes a more responsive tire, was consistently faster on the Dunlop even though he had quicker single-lap split times on the other two tires. David, who likes more slip, was consistently quicker on the BFGoodrich–likely aided by the fact that he runs them on this car all the time, albeit in a larger size (225mm) on a narrower rim (7.5 inches). Both drivers reported a disconnect between what the Dunlop’s carcass signaled and what the compound delivered. “The steering writes checks that the grip can’t cash,” said Andy, “so you have to recalibrate your inputs.” David went so far as to describe the tire as “boring” since it did not reward sliding around, though he did still like it a lot. FINAL THOUGHTS: The battle between BFGoodrich and Bridgestone remains unsettled, since each driver went faster on the tire that best matched his driving style. According to David, the BFGoodrich driver will have to look farther ahead and make even earlier inputs–two abilities that are not always typical of novice and intermediate drivers. Still, the BFGoodrich also tolerates mistakes better than the Bridgestone. The Bridgestone’s responsiveness also allows for later inputs, so long as they are the correct ones. INITIAL IMPRESSIONS: We have typically done our tire testing with wheels that are optimally sized for the tires. The rule of thumb says the measured tread width should match or slightly exceed the rim width. The tread width on 205/50R15 tires measures about 7.2 inches, which was a nice fit for the 15×8-inch wheels we used in the first round of testing. Based on experience, we predicted that our results would likely carry over to the 7.5-inch-wide rims found in the Street Touring S class. 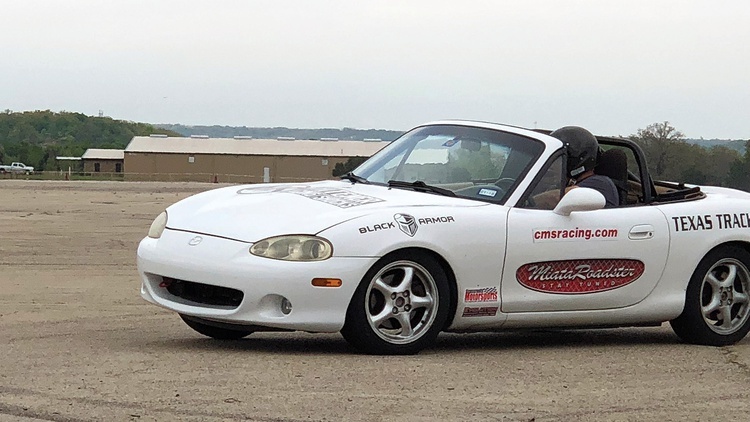 Our next round of testing using our E Street Miata had the potential to answer a couple new questions. What happens when you pinch that same tire onto a class-legal, 15×6-inch wheel? And does the limited camber of a Street-category car make a difference? Back on the autocross course, we went through the same testing cycle, although this time we used the Bridgestone as our control tire. The softer E Street Miata required a complete recalibration of inputs here. Before looking at the timing results, both drivers praised the Dunlop’s responsiveness for “fixing” much of the softer suspension’s slop, and both predicted that it would be the winner of our shootout. FINAL THOUGHTS: The actual times, however, show why we gather objective data: The stopwatch puts the Dunlop solidly in last place. By a lot. For both drivers. Conjecture is that the E Street car’s pinched installation and camber-challenged suspension localized the heat build-up around the outer edge of the tires, overheating them almost immediately. The steering response was still there, but not the grip. Common wisdom says that the Bridgestone, which has really stiff sidewalls, is better than the BFG in a pinched situation, and Andy’s results certainly support this theory. 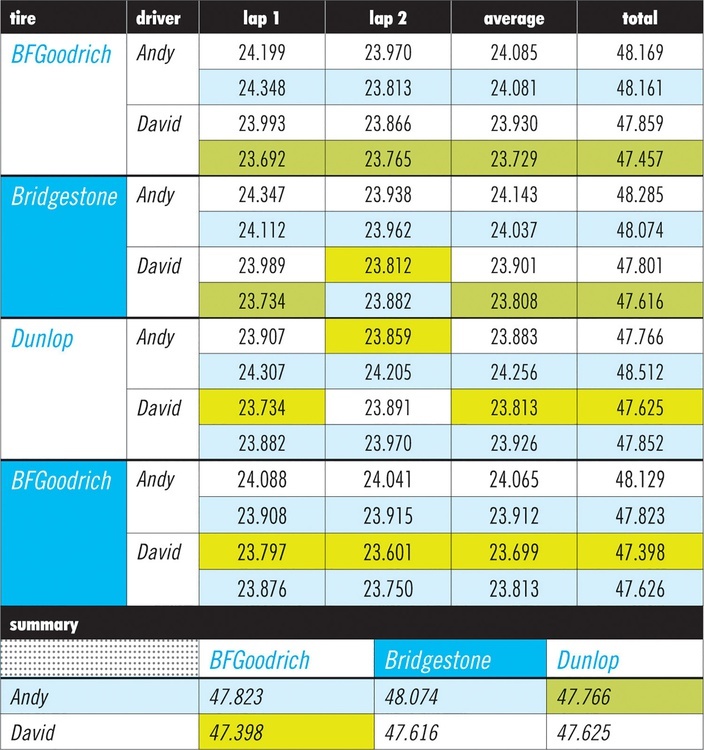 David, however, was slightly faster on the BFGoodrich than the Bridgestone, likely due to his extensive experience with the BFGs. As always, there is no single conclusion to be drawn from our testing. These sessions provide just one set of data points to be used as a reference in generating a “preponderance of evidence” that leads to a final answer. That said, it is quite clear that Dunlop has improved its Z-line enough that it’s on par with BFGoodrich’s Rival S and Bridgestone’s Potenza RE-71R–at least in certain circumstances. In those cases, optimal wheel sizing and suspension settings help distribute the tire loads across the tread face, keeping the Dunlop in its optimal heat range. Once it’s out of that sweet spot, however, this tire is heavily compromised. Further, it will likely be quicker than the others in the wet or in the cooler weather of the shoulder seasons, but slower in the heat of the summer. The continuing battle for top tire between the Bridgestone Potenza RE-71R and BFGoodrich g-Force Rival S 1.5 has no winner. These tires are both very good, but they suit different driving and setup preferences. Size can also be a determining factor: BFGoodrich builds some extra-wide sizes that work well in motorsports–they’re the only brand of the three to offer really wide 15s–while Bridgestone is focused more on popular OE fitments. BFGoodrich is only now expanding into 19- and 20-inch rim diameters with 275/35R19 and 305/30R20 sizes. Those should benefit late-model Corvettes and Porsches plus a variety of newer pony cars. Another factor in tire selection is availability. These tires tend to be built in batches and sell out quickly. If you don’t plan ahead, there’s a chance that your preferred tire model and size will be back-ordered. Our recommendation? Pick a tire, adapt both your car and driving to that choice, and then stock up. Harris Hill Raceway is the typical country club-style membership track. Cars and motorcycles are given their own days where members have free rein to run as much or as little as they want. Once a month, however, the track comes alive with legit wheel-to-wheel racing with the club’s own home-brewed H2R Miata Challenge series. The cars are all early Miatas prepped somewhere between Showroom Stock and Spec Miata. 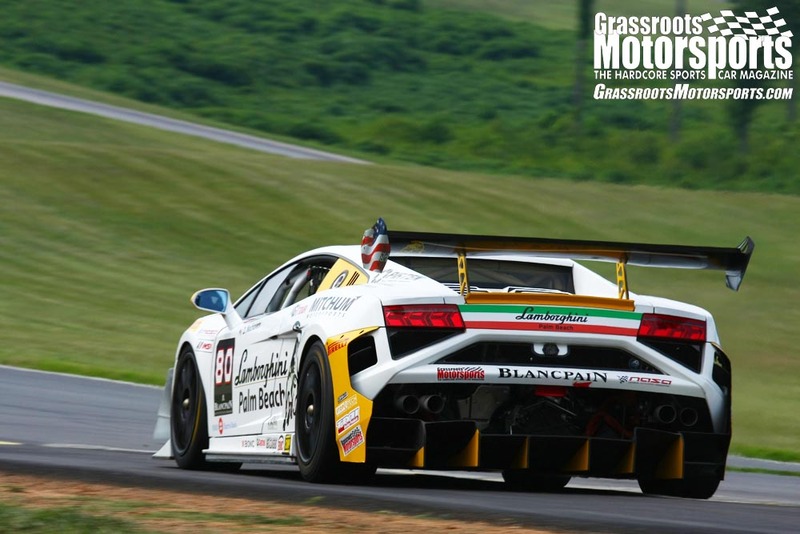 Some 50 cars have been built, with most race weekends attracting at least 35 entries. As with any competition, builders have found ways to make the cars faster and faster–to the point where they are now several seconds a lap quicker than originally planned, making each circuit a nearly flat-out affair. To improve the racing, organizers decided to slow the cars a bit, and the simplest way was to mandate a less-grippy tire. The challenge, however, was finding one that is also fun to drive, lasts a long time, and doesn’t chunk with track abuse. They settled on the Dunlop Direzza ZII Star Spec. The ZIII is now superseding the ZII Star Spec in our market, though, so a new spec tire was needed. Questions were asked: Will the new Dunlop degrade the racing even further by offering too much grip? Is there a better alternative? One key contender that kept popping up was the Falken Azenis RT-615K+, so we devised a test to evaluate the options. Pro racer and Solo national champ Tom O’Gorman, who was coming in fresh off a win at COTA in his first race of the Pirelli World Challenge season, was in town for that face-off. Tom gets up to speed very quickly and is very consistently at the limit–both important qualities in a test driver. Timers were installed, tires were mounted, and laps were turned. Since the ZII Star Spec was the current spec, it became our baseline and was run at both the beginning and end of the test. This also gave back-to-back comparisons against each of the new contenders in our A-B-C-A test rotation. Tom commented that the ZII Star Spec had good overall grip plus progressive breakaway both in cornering and under threshold braking. He also said the ZII provided nice, audible feedback, allowed a large slip angle, and was easy to adjust mid-corner with just the throttle. His baseline times were just north of 33.5 seconds, which is typical for the series. Then Tom moved to the theoretically faster ZIII. He said he found more overall grip but a noticeable rolling resistance when cornering, accompanied by a heavy steering feel. Feedback went from fairly quiet to a raging howl near the limit. Breakaway was more abrupt, although braking performance was improved. Surprisingly, Tom’s ZIII times were two-tenths slower than his times on the outgoing ZII Star Spec: 33.91 seconds versus 33.71. Next, Tom went out on the Falken. He found it to be more predictable than the ZIII with less drama near the limit. The Falken was also talkative and ran at a medium slip angle, although peak grip was lower than with either of the Dunlops. Lap times were six-tenths slower than the ZII Star Spec’s baseline round: 34.30 versus 33.71. Bracketing the test with the ZII Star Spec again showed that Tom was finding more speed as he became familiar with the car, dropping his average lap time on that tire by a half-second. That made the back-to-back delta to the Falken a full second–exactly what the series organizers were looking for. 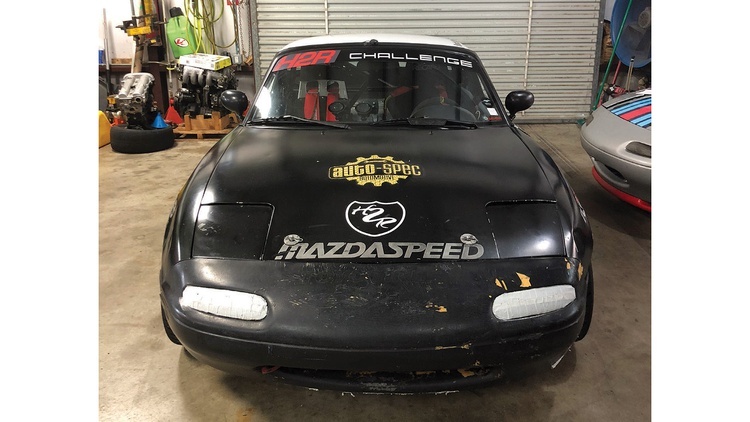 By virtue of being plentiful, inexpensive, slower and yet still fun to drive, the Falken RT-615K+ has been named the new spec tire for Harris Hill’s H2R Miata Challenge series. But wait, there’s more: The whole reason we originally went to Harris Hill that day was to mount and scrub our tires for the autocross test at Mineral Wells. 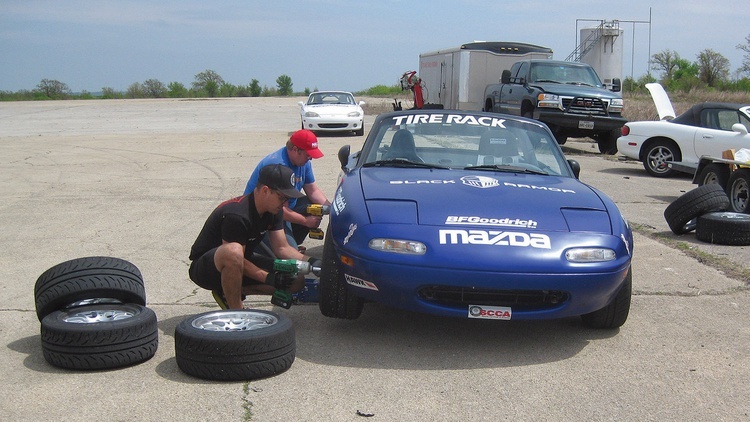 So while there we also mounted up our test tires on 15×8-inch wheels and put them on the H2R Miata Challenge car. Then we ran some laps–with a timer running, of course. While this wasn’t our usual scientific test, the data is nonetheless interesting, if not conclusive. The upshot is that the Rival S and RE-71R are largely interchangeable for lap times, although the latter did suffer from heat build-up and a subsequent drop-off in grip. The Bridgestone dropped off a bit on that third lap. The Dunlop ZIII was consistently a few steps behind both the BFGoodrich and Bridgestone. The test did reveal something interesting about the ZIII: It picked up eight-tenths of a second when moved from the 15×7-inch wheel to the 15×8. Do Larger Wheels and Tires Really Make You Faster? It looks like some numbers got transposed on the ES car results. Nice informative test! My only comment is to say that I've been running Dunlop Direzzas on my street cars ('99 M Rdstr, '99 M Coupe & '01 M Rdstr) for several years. One (1) set of gen one and two (2) sets of DZII SS (all are staggered 235/40x17 & 255/40x17 tires on 7.5" & 9.0" stock wheels for both '99s, and the '01 has 8.0" & 9.5" SSR Comps). They have excellent dry and wet traction__wet traction being frequently tested here in SW FL__inspiring confidence under all circumstances. The one (1) set of first gen tires should probably be swapped out soon, more due to age than wear, so I will stick with Dunlop, only the DZIIIs this time. I should look to see if the DZIIIs come in a 195/65 x 15 for my Healey, currently running on some aged out Hankooks! So basically once again nothing has changed this year. Want to be fast? Get the RE71R or the Rivals. Thanks for doing this test guys! It sounds like the Dunlop is in the mix depending on car setup, temp and driving style. I confess, I'm having a hard time understanding the results of the wider 225 on the ES car... can someone clarify? Were they all 225 on a 6" wheel on the ES car? What about a "Budget Tire Test" with the Ohtsu 8000, it's the reincarnation of the Falken 512 we loved for cheap when you tested it. Love the tire tests, lots of details in this one too! Ohtsu 8000 - is not in the same class. Additionally, they're not even tested in say the aggregation test data found on http://www.tyrereviews.co.uk . IMO GRM is doing a great job of testing tires intended for the specific purposes most relevant to its readers. they test tires that people are interested in at the pointy end of the field because that's what sells subscriptions..
tirerack already does these tests for free geniuses, GRM is built on bangs for the bucks and a Budget Tire Test would sell more than tires already tested. IMHO Bang for the buck means nothing if you can't be competitive in a competition environment. .........and that's what I love about it, when the guy with a cheap car and cheap tires beats everyone, now that's GRM. No one is winning with 300TW tires. GRM has tested various 200tw options for various budgets and even some >300tw-ish Michelin PS4(S) and Conti ECS, for people who want to blend activities with a true street tire. Maybe there's a chance you could land near the top in a less than competitive event with one of those. There are lots of other budget tires in the 300tw class that have been tested elsewhere, including options made by Ohtsu's parent company. 200TW is relevant due to ST classes and crap can enduro racing rules. Nothing makes 300tw relevant. I guess all the weekend warriors are nothing lol, I've seen BFG SS A/S tires turn faster laps than a 100tw tire on the same car. Hell I even bought a set of Conti DWS for the summer. Bang for the buck is cost per mile in my book. It all depends on what the end goal is. You openly stated TR posts videos and comparison info on their tires. So use that info for what you want to know. GRM tire tests offer feedback from National champion autocrossers in subjective and quantitative form. If you just want to turn laps and get max life from your tires regardless of what the times are and where you finish, that's awesome. But solo is built at its core as a driving competition and as such, people want to run the best stuff and the GRM tests give that data. Andy did the 300TW test because it's OLOA relevant info because the Tires have to do 3500+ street miles and last a week at 10 different tracks. GRM has also turned down tire test data from Whitener before and he's put it up on tracktuned.com when GRM didn't want it. The super 200's that have come out since the creation of SCCA Street class in 2014, and OUSCI have changed the game. These tires bring a breadth of performance and life options. The non Hoosier market of performance tires has lots of options now. Tires are also just more expensive. The price of a RE71R in a 205/50-15 has gone up 10% in the past 3 years. They're $128 today and in 2016 were $115. You and I come from very different schools of thought. I look at value per dollar to be competitive at the pointy end, otherwise all that matters is how long will a tire last. 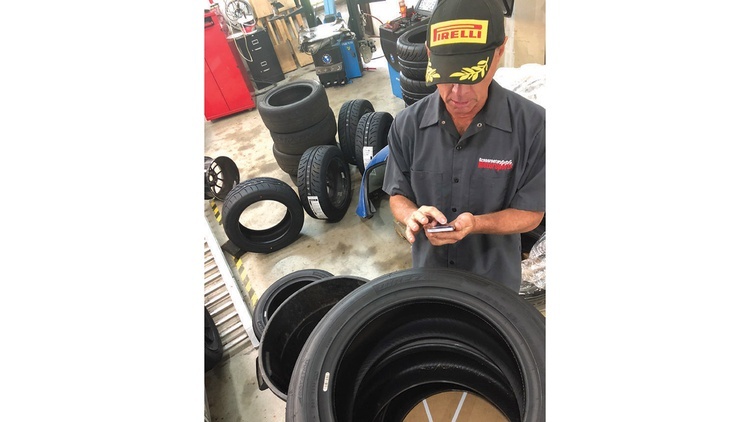 Organizing a test like this is the kind of circus that’s usually set to a soundtrack of “Yakety Sax.” First we tested our tires on the 15×7-inch wheels, which were mounted by John Long of Automotive Specialists. Long conveniently has a shop at Harris Hill Raceway in addition to his two main stores north of Austin, Texas. Those wheels and tires were fitted to the first test vehicle, where they were scrubbed and hot-lapped for time. Then we repeated that procedure with our 15×8-inch wheels. Those 12 tires then made their way to our autocross test site at Mineral Wells Airport in the back of a Mazda CX-9. 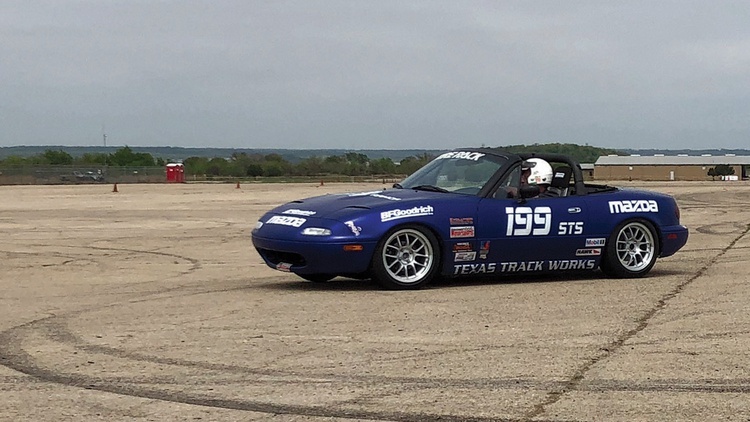 At Mineral Wells those tires met up with the second test vehicle for skidpad and autocross testing. After that, the tires were remounted on a different set of wheels for yet another test vehicle and tossed again around the cones. Finally, at the end of the day, the tires were stripped off those borrowed wheels so everything could go back to its rightful owner. Each leg of the test had to be completed before the day’s weather conditions changed, meaning we were constantly racing against the clock. On-site tire services at the airport were expertly supplied by Texas Track Works. In addition to their large race prep shop in Fort Worth, they have a mobile tire operation that is typically seen at NASA club races throughout Texas and Oklahoma.